For the third year in a row, an ITEA project has won one of the three prestigious EUREKA Innovation Awards. This year, ITEA 2 project MEDIATE won the 2018 EUREKA Innovation Award in the category ‘Innovations of Tomorrow’ during the EUREKA Innovation week in Helsinki (22-24 May). The award was announced by the 2018 Millennium Technology Prize winner, Tuomo Suntola. His ALD (atomic layer deposition) innovation is a nanoscale technology that is used to manufacture ultra-thin material layers for microprocessors and digital memory devices. 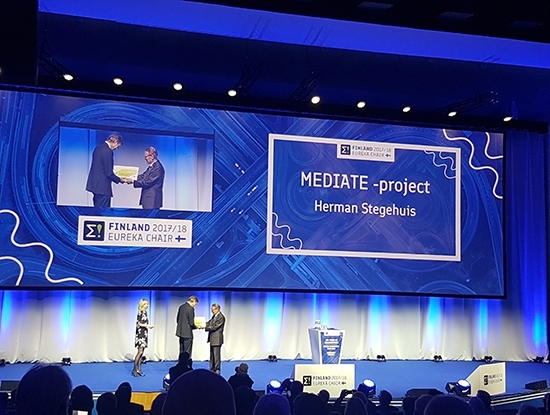 MEDIATE project leader Herman Stegehuis of Philips Healthcare presented the project during the plenary Innovation Award session in the afternoon of 23 May. The ITEA 2 MEDIATE project set out to support healthcare professionals in the transition from invasive open surgery to minimally invasive, image-guided interventions. Philips and its project partners from Belgium, France, the Netherlands and Spain, created new and improved imaging procedures, smart tools and an integrated systems architecture in compliance with international standards. These have been designed to enhance the efficiency, ease of use and accuracy of minimally invasive procedures. Thanks to its significant impact, the MEDIATE project has won the prestigious 2018 EUREKA Innovation Award in the category ‘Innovations of Tomorrow’. Furthermore, this project led to a follow-up ITEA project, BENEFIT, which will receive the 2018 ITEA Award of Excellence tomorrow (24 May), during the ITEA Event 2018 as part of the EUREKA Innovation Days. 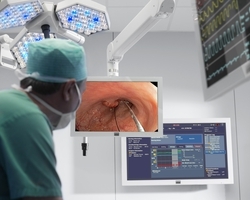 Philips will continue to build on improving minimally invasive surgery in the future in collaboration with partners to improve patients’ lives and support cost reduction in healthcare. “Because there are many simultaneous changes in healthcare (clinically, technically, regulatory, financially) and clinical applications are diverse, no single company can cover all innovation aspects on its own,” says Herman Stegehuis of Philips Healthcare, which coordinated the MEDIATE project.